BANGI, 4 November 2014 – More Malaysians should become volunteers to assist victims of natural disasters, wars and famines around the world. The founder of MERCY Malaysia, Tan Sri Dr Jemilah Mahmood said Malaysians should help those who are less fortunate than them. Dr Jemilah is a medical doctor and an alumni of UKM. Dr Jemilah’s plea was read out by Director of the Institute of Malaysian and International Studies (IKMAS) Prof Dr Rashila Hj Ramli after she was bestowed with an Honorary PhD (Humanities and Global Welfare) by The National University of Malaysia (UKM) at the seventh and last session of its 42nd Convocation here today. Dr Jemilah was unable to attend the ceremony due to her work abroad but the award handed over by UKM Pro-Chancellor Tunku Laxmana Tunku Dato’ Seri Utama Naquiyuddin Tuanku Jaafar was accepted by her husband Datuk Dr Ashar Abdullah. Dr Jemilah, a medical doctor, is an alumni of UKM. Prof Rashila said Dr Jemilah and MERCY Malaysia were well known for providing humanitarian assistance to victims, especially women and children. Dr Jemilah has criss crossed famine and war torn areas leading Mercy Malaysia to provide aid and assistance in various places including Kosovo, Iraq, Syria, Somalia and Cambodia. “She has been credited with talent management in humanitarian negotiations and international arbitration,” said Prof Rashila. “Dr Jemilah in her message said the world is facing huge challenges, with the uncertainty of nutrition, the impact of global climate change, unrest, refugee crises and humanitarian issues. These all have an impact on the economy. “The integrity of a country does not rest with skyscrapers, huge buildings or high income. I was disappointed that I couldn’t come (to accept the award). But my family is representing me in this hall,” she said in her message. MERCY Malaysia is a task force that provides humanitarian assistance, health screenings and negotiations in conflict zones and natural disasters. 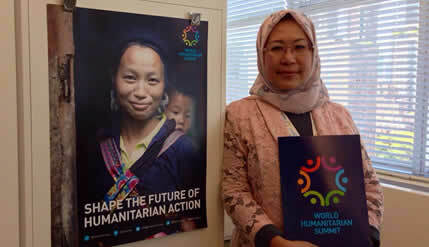 Due to Dr Jemilah’s work and efforts, MERCY Malaysia is the first association in Asia and the third in the world to achieve the Humanitarian Partnership Accountability certification. MERCY Malaysia has thus achieved international standards in the transparency of its operations. Response from Tan Sri Dr Jemilah Mahmood to the award of Honorary PhD (Humanities and Global Welfare). CLICK HERE TO WATCH THE VIDEO.